“The Simpsons” is an American animated television situation comedy created by Matt Groening. “The Simpsons” began in 1987 as a series of animated shorts that were part of “The Tracey Ullman Show” (1987-90) that were eventually developed into a half-hour animated TV series. “The Simpsons” began broadcasting in December of the 1989-90 television season on the Fox Broadcasting Company, where the series continues to this day. “The Simpsons” presents a satirical depiction of a working class family which consists of Homer Simpson (the father), Marge Simpson (the mother), Bart (the oldest child and only son), Lisa (the precocious and brilliant elder daughter), and Maggie (a baby girl). It also parodies American culture, pop culture, society, etc. via the denizens of The Simpsons home town, Springfield. Bongo Comics (Bongo Comics Group) has been publishing comic books based on characters featured in “The Simpsons” since 1993. HarperDesign, an imprint of HarperCollins, has been publishing trade paperback collections of various Bongo Comics' Simpsons titles and the short stories that have appeared in those comic books. The latest is Simpsons collection is Simpsons Comics Knockout, which reprints the Simpsons clan' adventures that were first published in Simpsons Comics issues #116, #117, #118, #119, and #120. These issue-length tales take Matt Groening’s first family of American satire from the local mall to continental Europe. In “Mall or Nothing,” after refusing to sell their home to developers, the Simpsons wake up to find that they now live in a mall. In “Sandwiches are Forever,” Homer's trip to the nation of Turkey for a sandwich lands him in jail where he meets the secret agent, Scorpio. In “The Flunky,” Homer finds himself in a reality show created by C. Montgomery Burns to distract from his lack of popularity with the people of Springfield. In “Homer Drops the Ball!,” Homer and Bart show the worst sides of their personalities after catching a record-setting baseball. In “The 'X' Men,” Principal Seymour Skinner leads a group of men who become extreme sports stars after being dumped by their girlfriends, but what happens when love returns? THE LOWDOWN: I had not read a Simpsons comic book in ages, maybe at least a decade. Then, HarperCollins/HarperDesign started sending me copies-for-review of their Simpsons trade paperbacks. I always enjoyed Simpsons comics titles, so I don't remember why I stopped reading them. Simpsons Comics Knockout and the other one I read, Simpsons Comics Colossal Compendium Volume 4, are quite entertaining. Truthfully, Bongo's Simpsons comics remain some of the best American satirical comic books published over the last three decades. The one thing that connects them is that each story feels free to skewer American society, politics, culture, and pop culture. “Mall or Nothing” satirizes consumerism, but reveals that even the oppressed will bow down before the chance of a cash windfall. “Homer Drops the Ball!” revels in the fickleness of the public and the shamelessness of naked greediness. “The 'X' Men” has fun with our need to be loved and wanted. Simpsons Comics Knockout is not just another Simpsons comics collection for the book market. It is a collection of high-quality humor comics. The people behind Simpsons Comics are not content to merely create licensed comics; they want to create comics that capture the spirit of “The Simpsons,” which is really a domestic comedy that loves to poke fun at the home front. The truth is that outside of Simpsons Comics, few people are creating consistently good comic book comedy. 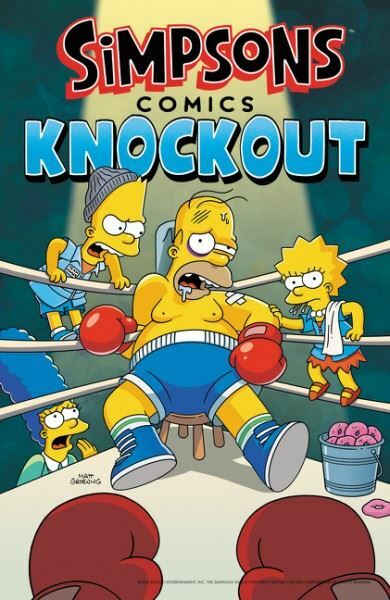 I READS YOU RECOMMENDS: Fans of “The Simpsons” and of humor comics will want to experience Simpsons Comics Knockout.